the velvet bird: Meet my OTHER new friend!! Meet my OTHER new friend!! A little bit before leaving for our Washington Christmas trip, I got tattooed! It's not finished yet, I'm going back in really soon to get the old flowers redone to match the style a little better and finish a background/frame. But I thought I would share my progress as we go along! I had been thinking and thinking for most of the year about what I wanted to get. Well when I came across this Etsy shop, I knew right away that one of those illustrations would be on my arm forever. Eventually, this guy spoke to me...just look at those eyes and you try and say no. I am now a lifelong fan of Berkley Illustration. For the life of me, a picture would just not turn out no matter how hard we tried. Tattoos usually look BETTER in pictures! Oh well, these will just have to do for now. Oh, you should also know that Patrick named my new tattoo while he was being created. George, George Cooney. My fear of needles verges on a very serious phobia, just ask anyone who has ever had the misfortune of giving me a shot. So I HATE needles and getting tattooed, its terrible but I've got plans for a lot more. I'm an idiot. I would like to take a moment to ask all of you lovely, lovely (and extremely appreciated and cherished) readers... what would you like to see more of on this blog? I would like this place to be more well rounded- more cooking, crafts, DIY, fashion, etc. So I thought I'd ask what you'd like to see in the near future! 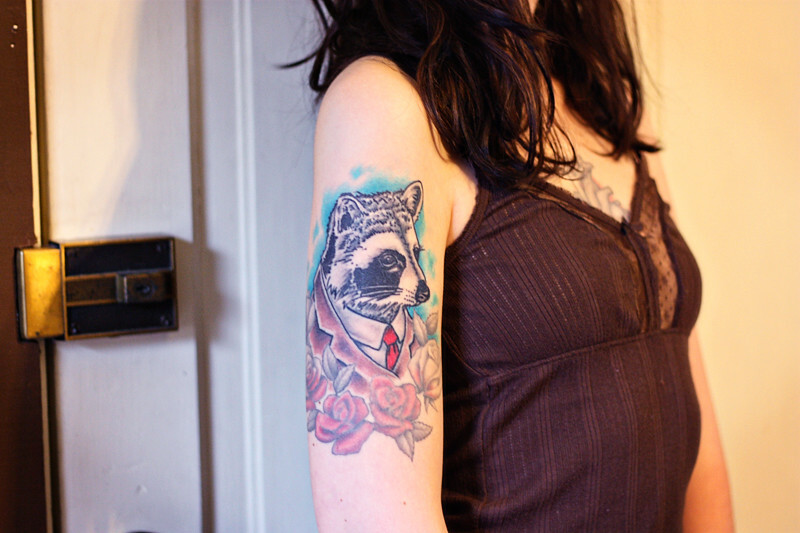 I`d like to see more of everything...more tattoos, more diy`s, and beautiful pictures! this is gorgeous! berkley illustration has some really amazing prints; they actually sold at urban outfitters for a bit. i'd love to know who did your tattoo! Your tattoo is awesome!! My fiance and I are getting tattoos as wedding presents to each other.. I'm still brainstorming what I want though! Your artist was really, really good. yeah! more of everything! I would like to see more! woahh! i love that! it's so amazing. Oh wow! This is so amazing! What a beautiful piece! I love the nickname for it too. I lovew how your blog is already, but always fall for your outfit posts. So more of those would be great! You have such great style, I would love to see more fashion posts. aww i love it! very cute!! i'm deathly afraid of needles too. it's bad. so i completely understand about getting shots. i doubt i'll ever be able to get a tattoo so you've got me beat. ha! This looks fantastic! I love Ryan Berkley, and this is one of my favorite portraits of his. I have the same oxymoronic problem with tattoos and needles. I love my tattoo and want more, but the thought of a shot makes me nauseous and sweaty. Yes, we are retarded (but we look so good with ink!). 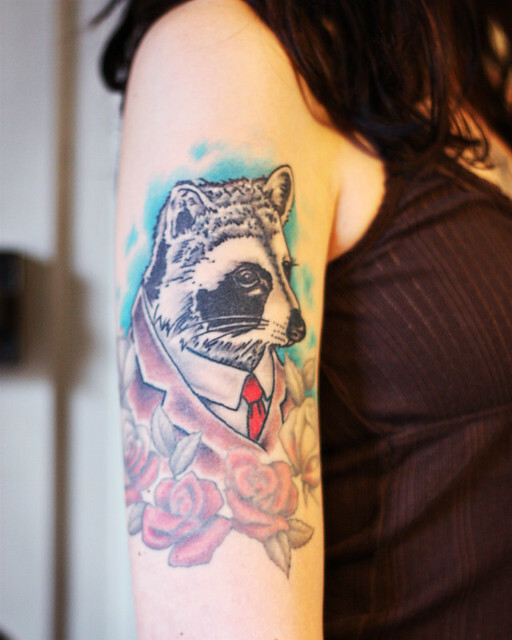 that's such a cute tattoo! i would love a tattoo post (if you haven't done so already) so we get to see all the ones you have, they look very interesting!! Just keep being you. that's what I want to see more on your blog!